Inaccurate justifaction, dodgy type, box borders? Our rubber side sticks might help. Use them at the end of lines (as shown above, with furniture) to help take up the slack. 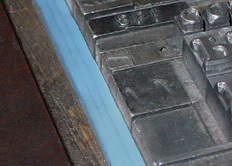 To save space in the forme, our new Side Sticks are thinner than the old blue stock shown in the picture. They now feature an even grippier surface to hold your type snugly in place. New stock is now 6pt thick and now 36em long. Easy to cut to length. Use the grippy textured side against the type and smooth side against the furniture. Synthetic rubber for a long life. Ideal for new compositors or anyone who struggles with justification. Helps compensate for the mathematical jumble caused by box borders or mixing blocks with type in the same forme. Reduces strain on the chase; cast iron chases can (and do) crack if you do the quoins up too tightly. Skill level: All. Especially recommended for beginners. Find out more about using these in our Rubber Side Sticks Guide.